I finally finished building and playtesting my portal gun mechanics!! Allows player to click to cast both entrance and exit portals. exit "instantly" becomes an entrance. portals transport player within the map or across maps, will not allow payer to become stuck, portal placement is saved forever until portals are dispelled or recast elsewhere. no plugins used. BOOM! Thank you! I am so relieved!. I've been trying to get this working as envisioned for years. You should upload it to the resources for others :D This sounds amazing, or if you'd like to be rewarded for your hard work, feel free to sell it as well! I am willing to provide some pointers to any who need it. its a bit large to put up. it spans across 2 events per map, 8 common events (might be able to reduce that to seven), 9 variables and 8 switches that are entirely devoted to this, plus a few more. I know how to show a picture, and I know how to rotate a picture, but how do you bind the rotating picture to the map? 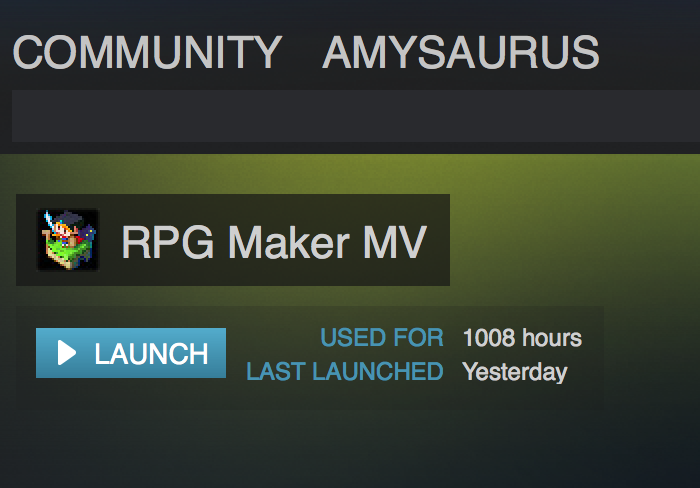 As of today 557 total hours on MV according to Steam. Of course that's just online. Probably have more than that offline. impressive Amy. are you usually online with steam? most of my time spent on MV is offline. my mobile data is pretty limited and my laptop gobbles it up. Usually I am, but every now and then I stay offline to avoid getting a bunch of messages. And oh gosh, I'm not always actively using it, hehe. Sometimes I've had it open for days before without realizing it, lol! i want each character class play through to be a unique experience, but how much time is too much to spend developing one project? Who knows how to use the "show choice" script call? how and where do you enter the outcome of each choice? Anyone have a script to set the name of an item id# to a variable? Does anyone here have experience emulating side-scrolling mechanics without plugins? I don't think it would be possible. You could use JS snippets in the events instead of plugins but I'd say a plugin would be required for a solid platform mechanic. I assumed that some js scripts would be needed. I am hoping someone with experience can help. I'm trying to set a password on the players PC/Item storage system that I am creating. A numerical password would be easy, and unrealistic. Read the post again, it says "A numerical password would be easy, and unrealistic." also read my comments. Wait, so it isn't something like that XD then sorry for my blabbers, I'm a hasty kind of guy. Dicking with the software and finding this community make gaining some kind of proficiency seem a bit daunting. I don't know where to begin. I'm making a game but taking my time to learn to learn the software. I've made a lot of progress so far but there is so much to learn. My game has so far about 60 maps and a bunch of events, but no NPCs or storyline. I want to finish all my maps and refine my story before I start writing it in. There are a lot of resources and tutorials on this forum. There is a diversity of skilled members too. If you do not find an answer, find the appropriate category and ask away.